Age 10 years and older: 1 capsule daily, or as directed by physician. 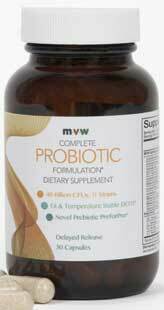 MVW Complete Probiotic Formulation Dietary Supplements are safety sealed for your protection. 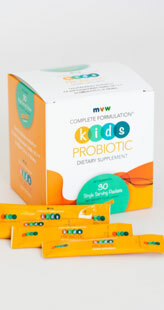 If the safety seal is broken or missing, do not use and contact MVW Nutritionals, LLC immediately at 1-855-236-8584. Keep out of reach of children. Use caution when administering to children or individuals who have difficulty swallowing capsules. Weiss B, Bujanover Y, Yahav Y, et al. Probiotic Supplementation Affects Pulmonary Exacerbations in Patients With Cystic Fibrosis: A Pilot Study. Pediatric Pulmonology. 2010;45:536-540. Rogers GB, Carroll M, Hoffman L, et al. Comparing the microbiota of the cystic fibrosis lung and human gut. Gut Microbes. 2008;1:85-93. Spiller R. Review article: probiotics and prebiotics in irritable bowel syndrome. Alimentary Pharmacology and Therapeutics. 2008;28:385-396. Chmielewska A and Szajewska. Systematic review of randomized controlled trials: probiotics for functional constipation. World Journal of Gastroenterology. 2010;16:69-75. Quigley, EMM. The enteric microbiota in the pathogenesis and management of constipation. Best Practice and Research Clinical Gastroenterology. 2011;25:119-126. Distrutti E, Monaldi L, Ricci P, Fiorucci S. Gut microbiota role in irritable bowel syndrome: New therapeutic strategies. World Journal of Gastroenterology. 2016;22:2219-2241. Di Nardo G, Oliva S, Menichella A, et al. Lactobacillus reuteri ATCC55730 in Cystic Fibrosis. Journal of Pediatric Gastroenterology and Nutrition. 2014;58:81-86. Gillanders L, Elborn J, Gilpin D, et al. The airway microbiome in cystic fibrosis: Challenges for therapy. 2011;8:645-660. Ojetti V, Ianiro G, Tortora A, et al. The effect of Lactobacillus reuteri supplementation in adults with chronic functional constipation: a randomized, double-blind, placebo-controlled trial. Journal of Gastrointestinal Liver Disease. 2014;23:387-391. Infante P, Redecillas F, Torrent V, et al. 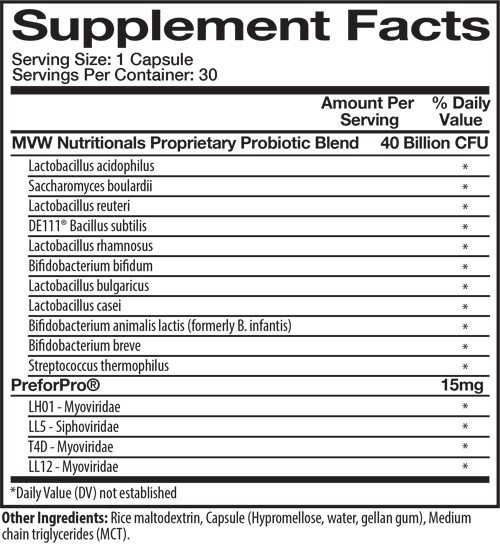 Improvement of intestinal function in cystic fibrosis patients using probiotics. Anales Pediatria. 2008;69:501-505.